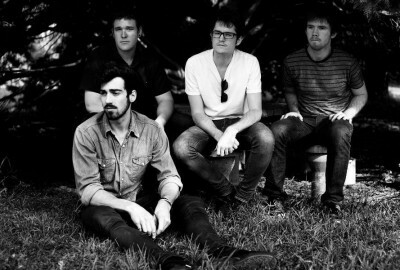 Indie quartet Lowlakes have dropped their latest single “Song For Motion” from their self-titled EP. My impression after the jump. If this song moves at any type of speed, it”s definitely a snail”s pace. Opening softly, the track has a “Baba O” Reilly”-esque feel to it as ambient sound effects teem about, leaving the gate open for pummeling drums, roaring distortion, a whirling dervish of synthesizers, or any number of soft-loud dynamic shifts. of being in the fields left to fend for your meals here. Instead “Song For Motion” unfurls slowly, almost subconsciously, as watery guitar chords, serene piano licks, gently clicking drums and frontman Tom Snowdon”s emotive vocals all coalesce together to create an effect that is ….odd. Yet also oddly compelling and relaxing. It”s a soundtrack tailor made for a slow-mo dive into a deep blue swimming pool, long winding drive or tumbling into bed.